Pool day! You’ve got your book, your shades and your well-honed Marco Polo skills. All you need as an icy-cold… something. We’ve offered up plenty of boozy options in the past, so this time around we thought a liquor-less option might be a fun way to fill your pitcher. Disagree? Just add vodka. Cucumber and water go together like bathrobes and spa’s: a match made in heaven. Add basil and lemongrass and you, my friends, can officially consider yourselves in spa mode. Combine cucumbers, lemongrass, basil, lemon juice, sugar and salt in a blender. Blend on high until smooth for approximately 1 minute. Strain through a fine mesh strainer into a pitcher. Discard solids and add cold water and whisk. Serve in ice-filled glasses and garnish with cucumber slices and basil leaves. We all know about lavender’s wonderful aroma and calming properties.. Surely a lavender lemonade would have the same effects, right? Try this unique recipe and experience the herb’s soothing properties for yourself! 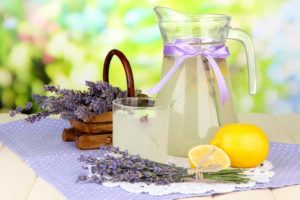 Place the lavender in a pitcher and pour the boiling water over the lavender. Cover with plastic wrap and allow to steep 10 minutes; strain and discard the lavender from the water, returning the water to pitcher. Add the cold water, lemon juice and sugar to the pitcher and stir until the sugar dissolves. Refrigerate until serving. It’s hard to deny this unbeatable combination, folks! Strawberries and lemonade go together like kids and summer vacation (maybe almost as well). Give this recipe a try and get ready for the kids (and adults!) to come flocking. In a 2 quart saucepan, bring water and sugar to a boil. Reduce heat and simmer until the sugar dissolves. Remove from heat; stir in lemon juice. Let cool completely. Place strawberries in blender with 1/2 cup lemonade mixture. Blend until puréed. Strain purée through a fine sieve to remove seeds. Add purée to remaining lemonade mixture; stir well to combine. Refrigerate until serving. Stir in seltzer. Pour over ice. Garnish with lemon and mint if desired. 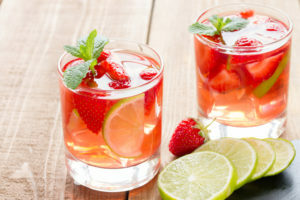 In honor of the summer games, we present this tasty thirst quencher. Intrigue your friends and family with this original (and festive!) choice before sitting down to watch your favorite events. We guarantee this will be a crowd pleaser! Stir 7 cups of cold water with 3/4 cup of sugar and set aside. Add 1 tbsp of lime zest and add juice from 5 limes into a blender jar. 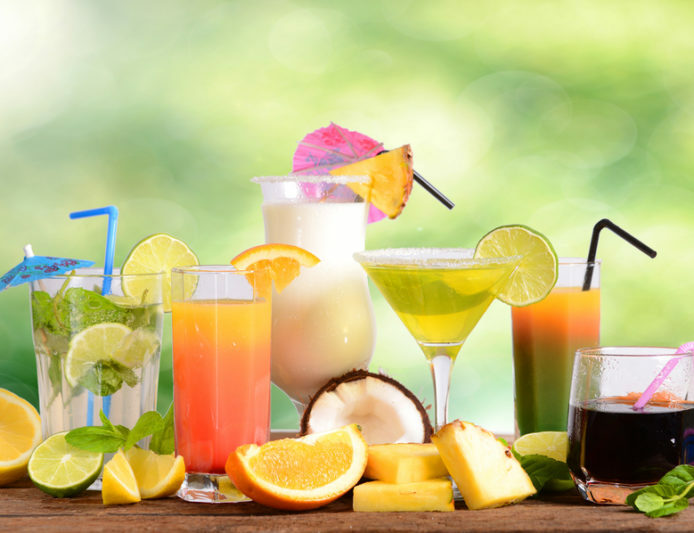 Pour 3 cups of the sugar water into the blender. Add 1/2 cup of sweetened condensed milk. Blend until smooth and frothy. Stir in remaining sugar water and serve over ice.